Fifty years ago, 250,000 people turned out in Glasgow's streets to say goodbye to the city's trams. It was half a century ago, but for many people who remember the last tram procession which took place in Glasgow on September 4 1962, it was like it was yesterday. Twenty trams glided over rails through the city, winding from Dalmarnock tram depot in the east end through to the city centre and down Pollokshaws Road to Coplawhill tramworks, which is now the Tramway theatre. Over 250,000 people came out to say goodbye to the trams, some from the rest of the UK and ‘There wasn’t a dry eye in the house,” remembers Hugh Dougherty. “I always remember it,” he explains, “Because I got belted the next day at school for dodging my maths homework. “My mother and I went down to Coplawhill and stood outside. 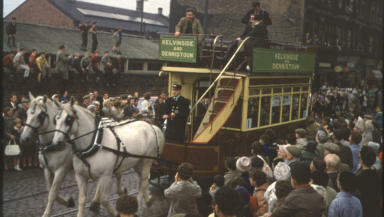 Thousands of people watched all the trams – the bus tram, the early electric trams – go down Pollokshaws Road and go right into the depot for the last time. “The Coronation Tram was the very last tram in the procession that night and I put a penny on the tram as a souvenir to get it squashed and I’ve still got that penny in the house. 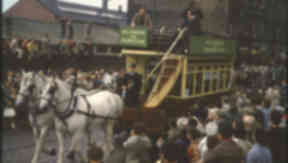 Twenty iconic trams from the last 90 years of city history took part in the route, led by a horse drawn tram from 1894. 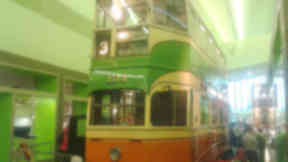 Seven of the models were kept for the first transport museum, including the grand Coronation Tram which has been brought out from storage in Nitshill to be displayed at the Riverside Museum. The trams had been slowly withdrawn from Glasgow life for many years and just before the procession, the only route running in the city was the number nine from Auchenshuggle to Dalmuir. “I stayed in the west end and then in Scotstoun,” explains tram enthusiast Brian Longworth, “Which was very fortunate because around there was the last route. It was right on my doorstep so I was able to use them till the end. “I was glad they were going in to the museum so there would be something left. And Brian has a very special memory of the last tram procession, not because he was one of the 250,000 strong crowd, but because he had a coveted ticket for one of the last trams on the route. “The tramway society actually got a block booking so I gave my ticket to my mother and I was able to go on the society tram. “All the trams that were earmarked for the museum were to be for the councillors and special guests. They weren’t available to the public in case they got striped. It is often said that the dreich weather that day perfectly matched the mood of Glaswegians, who were saddened to see the trams which they felt so strongly about leave the city for good. Glasgow was one of the last cities in the UK to remove trams, which caused people to travel the length of the country to get a glimpse of the last twenty in use. “I remember it was not the best of days and the crowds…I’d never seen any crowds like it,” says Brian. “It was a bit of a disadvantage being on the procession because you couldn’t see the other trams but you could see all the crowds that had turned out. “It was good to see that so many people were out to see them going.